7 September 2018 | Four years ago, companies, countries, and indigenous organizations endorsed the New York Declaration on Forests (NYDF), which is a set of ten goals designed to cut natural forest loss in half by 2020 and end it by 2030 – pledges that have sparked a complete realignment of global supply chains, according to an analysis by the Tropical Forest Alliance (TFA2020). 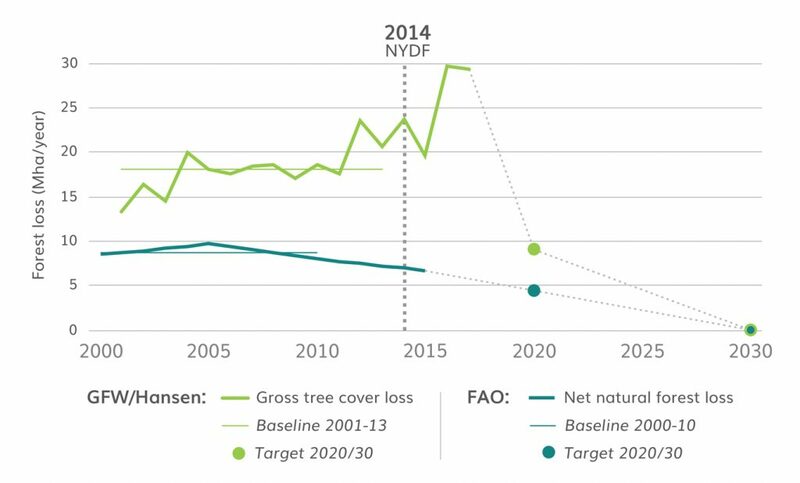 Unfortunately, deforestation rates have continued to increase, leaving the world far off track from meeting the 2020 goal, according to the latest NYDF Progress Assessment, which was released this week by the NYDF Assessment Partners, a consortium of over 20 major nongovernmental organizations and research institutions. Driving the deforestation is a continued expansion of agricultural production, especially palm oil in Southeast Asia and soy in Latin America, although forest fires in the Amazon also took their toll, as did hurricanes in the Caribbean. Ironically, the advent of peace in Colombia also contributed to the rise in deforestation as it made the forests safe for agriculture. The report also identified positive results, especially in Indonesia, where a moratorium on the drainage of peat forests led to a 60 percent drop in deforestation last year compared to 2016, which is an emission reduction of 200 million tons of carbon dioxide. The report is broken into ten parts, each committed to a separate goal. The Goal 1 assessment, authored by Nancy Harris and David Gibbs of the World Resources Institute, is available here.